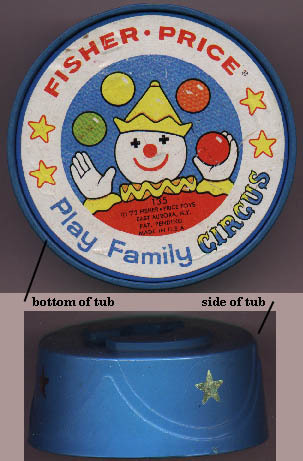 Description: Fisher-Price created the Play Family Circus after the #991 Circus Train became a hot seller in 1973. This set reused most of the #991's accessories, along with 6 new exclusive trapeze parts. Apparently, it must not have sold as well; the Circus Train was manufactured until 1986, while the Play Family Circus died a decade earlier. As usual, the hard to find piece is the most nondescript: the yellow H-shaped connector, plenty of which most likely got thrown out the minute they were separated from the set. 2 each - FPT32 - Yellow 7-rung ladder with a half-circle "bump" in the middle (a step to support one person standing halfway up - step is reinforced by half-circles that extend from the sides). FPT136 - Round red circus hoop. The hoop has a rectangular standing platform on one side. The sides of the platform can attach to the 2 yellow circus ladders. FPT256 - Yellow rectangular circus trapeze piece. The trapeze has a thin "bar" on one end, and a rectangular "stand" tab on the other end. The "bar" has 2 tabs on the side (to attach to the FPT32 ladder), and 3 scallops on the inside area. FPT16656 - Blue ladder stand (round tub-shaped stand with 4 stars around the base and a slot in the top for the end of a ladder - to hold ladder upright, also has a litho on the bottom of a clown, click here for an illustration). FPT37 - Yellow H-shaped ladder connector ("H" shaped piece that joins 2 ladders FPT32 end to end). XS - Yellow lion with a black mane and tail. XA - Blue elephant with gray ears and a curved trunk. The trunk is designed to hold a Little Person. XC - Tan giraffe with black horns and orangish-brown spots on his legs and body. OWP - Short black body ringmaster (small moustache, white bib on chest, and a black top hat). DUWP - Deep red body clown with a yellow ruffled collar and pointed hat. FP135BOX1974 - (BOX ONLY) - This set was sold in a box marked "Play Family Animal Circus". 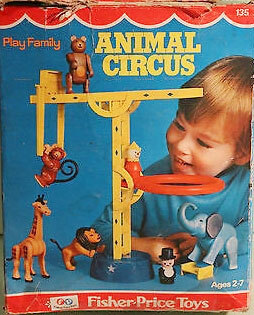 FP135SET1974 - (COMPLETE SET) - Complete set in original box marked "Play Family Animal Circus".